Do You Need an Experienced Bone Fracture Attorney in the Sacramento Area? 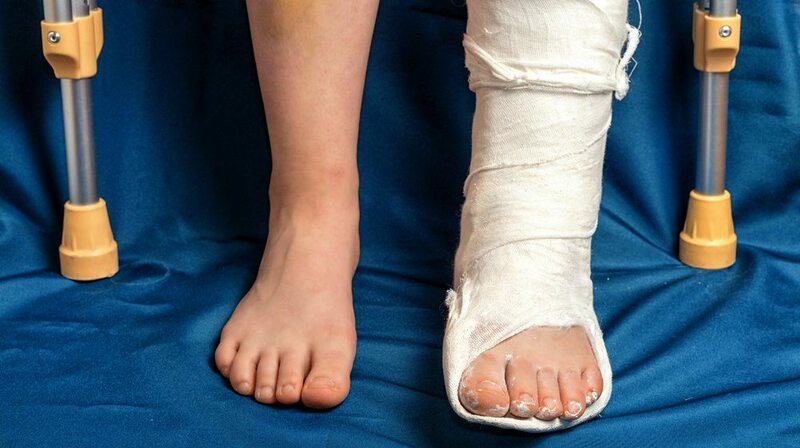 Bone fractures are significant injuries often requiring medical attention for weeks, sometimes months. My name is Ed Smith, and over the years, I've represented countless individuals that have suffered these types of injuries. I've had particular success working with children that have suffered severe bone fractures due to an accident. A serious bone fracture in a child can cause health concerns for years to come. I specialize in representing clients that have suffered all types of bone injuries including fractures and dislocations. This field of injury law requires experienced personal injury litigation attorneys. If you've suffered this unfortunate injury as a result of someone else's fault, let my law firms expertise help you. Bone fractures can be severe and life-altering. I understand that your immediate goal after going through such trauma is to get your medical bills paid and covered, make sure you do not suffer financially through any lost wages, and make sure your insurance company will pay for future treatment relating to your injuries. When you’re in a car accident, it is not uncommon for the forces involved in such high-speed collisions to cause fractures of one or more bones. Fractured bones can be closed, meaning no part of the bony fragments has pushed through the skin. They can also be open, meaning there is a connection between the broken bone and the outside world. Open wounds put you at risk for infection. Either way, they need medical attention and management. The head and neck are particularly vulnerable to fracture, particularly if you are not seat belted. The head can come forward or upward, causing contact between the console, steering wheel or even the back of the front seat or top of the vehicle. These injuries can lead to skull fractures. There are many types of skull fractures including linear skull fractures, comminuted (crushed) skull fractures, and depressed skull fractures. Fractures that are depressed can push on the brain and bruise its tender surface. Basilar skull fractures are fractures of the base of the skull. Skull fractures can be particularly dangerous because they can lead to bleeding in and around the brain. This excess bleeding can cause pressure on the brain, which can be fatal. Facial fractures are also common because front-end collisions tend to push your face forward into the dash or into the seat in front of you. This is somewhat helped by being restrained or having airbags. Facial fractures can involve the bones surrounding the eye (orbital fractures), maxillary fractures (where your sinuses are), and the mandible or jaw bone. These fractures can often be out of place so that your bite is off and you can’t chew properly until the fracture is repaired. Neck fractures are particularly dangerous. As the head snaps forward, the ligaments that support the cervical spine get ruptured or stretched. You can also get fractures of the supporting parts of the vertebrae so that one vertebra slides over the top of another one. This can bruise or cut the spinal cord, leading to quadriplegia. The cervical spine can be fractured at any level and can be so severe that you lose your ability to breathe for yourself. Your arms are not very well restrained and can be injured in head-on and side-impact collisions. The upper humerus can be fractured in side impact injuries or in situations where you stretch out your arm in anticipation of a collision. The part of the humerus that forms the shoulder joint can be fractured, resulting in a serious injury. The elbow can also be fractured, either the distal humerus or the proximal radius and ulna. This can occur when the forces of the collision are applied to the outstretched elbow, as in when you are holding your hand outstretched. Elbow fractures can easily be open fractures and require operative repair by a surgeon. Wrist fractures can happen when you reach out, and the force of the collision reaches the wrist joint. Usually, such a fracture involves the proximal radius and ulna. These are repaired using closed reduction under sedation and by casting the wrist. The small wrist bones can be fractured, too, depending on the location of the forces of the collision. The sternum itself can be fractured, particularly if the bone makes contact with the dashboard or steering wheel. It can cause bleeding in the space behind the bone, and it can put undue pressure on the heart, situated beneath the sternum. The entire body can be thrust forward in a head-on collision in which the person is not restrained. Lateral collisions can also put undue force on the back, causing fractures that are worse on one side of the body than the other. Rib fractures are often associated with these types of fractures. When the lumbar vertebrae are fractured, they can disrupt the spinal canal and can cause a laceration through the spinal cord or spinal nerves. This can result in paraplegia, or the inability to move or feel anything in the legs and parts of the trunk. The pelvis is a ring of connected bones that protects the pelvic structures, such as the bladder and the reproductive organs. It is generally very well protected except in situations where extreme pressure is put on the body. Car accidents involve extreme forces and things like ejection from the vehicle. The fractures can involve the connection between the sacrum and the ilium or can involve fractures of the thin rami of the pelvic bones. The hip can be fractured. The fracture can occur at the level of the acetabulum, which is the socket part of the pelvis. The ball of the joint or the proximal femur can be fractured as well. This leads to a complete inability to walk and is a fracture that must be repaired surgically with an open reduction and installation of an artificial joint. The legs are particularly vulnerable in a motor vehicle accident as they are the first thing hit during a front end collision. They are also the first thing hit in a side impact collision. The leg can be fractured anywhere—from the femur in the thigh to the tibia and fibula in the lower leg. Both types of fractures can easily become open fractures, with fragments of bone sticking out through the leg. The fractures of the femur are often fixed surgically, while the fractures in the tibia or fibula area may need surgical repair or closed reduction with casting until it heals. The ankle can be fractured when a front end collision puts extra pressure on the ankle. The ankle bends one way or another, and the supporting bones are fractured. If you have suffered a fracture as a result of someone's negligence, contact me by e-mail or Call me at 916.921.6400, to set up a FREE consultation.